The PolarPro Over/Under Dome was designed so you can capture creative split-level photos and videos. 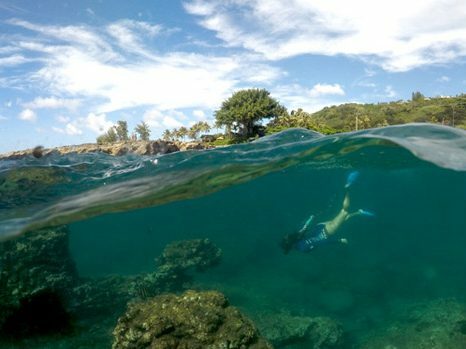 The Over/Under Dome pushes water away from the camera lens so it can capture what is under and over the water line. It is compatible with the GoPro Hero5 Black camera only. The latch system allows you to quickly and securely install your GoPro Hero5 from the Dome. The dome is designed using PolarPro’s custom optics specially for the Hero5 Black. The Over/Under Dome comes with a grip, and when used together will float your GoPro. The Hero5 Black installs right into the port, so you do not need any extra housings. 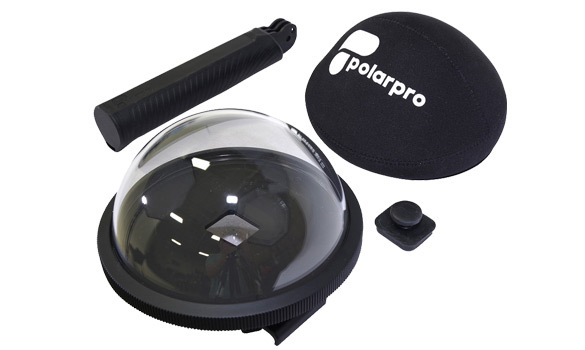 Capture new and creative split level shots with the PolarPro Over/Under Dome. This PolarPro Dome allows you to capture unique over/under shots with your GoPro Hero5. This Hero5 dome uses PolarPro optics for capturing razor sharp images and videos. Installation is easy, simply place your Hero5 into the Over/Under Dome and lock it down. Included with the Hero5 dome is a floating grip, as well as a neoprene lens cover for traveling. This Hero5 Dome is intended to be used with the Hero5 Black Camera for split level surface shots. It is not intended for diving as the Hero5 is only waterproof to 10m (33 feet). The PolarPro Over/Under Dome has the ability to capture epic split level shots, however don’t expect to go out on your first film day and shoot print quality images. Shooting with a dome takes practice for a few reasons. First, a dome by nature is going to introduce more ways for light to reflect off and enter the Hero5 lens. To reduce lens flaring and capture a clean image, always try to shoot with the sun behind you. If you are shooing into the sun, lens flaring is almost guaranteed. The second thing you will want to practice is framing with the Dome. We recommend practicing in a pool to get used to how your shots are going to look when you hold the Dome at different angles and levels. Be sure to try out different Field of View settings and video vs photos to get a feel for what your content is going to look like in the wild. The more you practice with the GoPro Hero5 Dome, the better your images and video will look when you are on location.